What’s a Red Cross dispatcher? Across the United States, the American Red Cross has people who volunteer their time as dispatchers during Red Cross disaster responses. 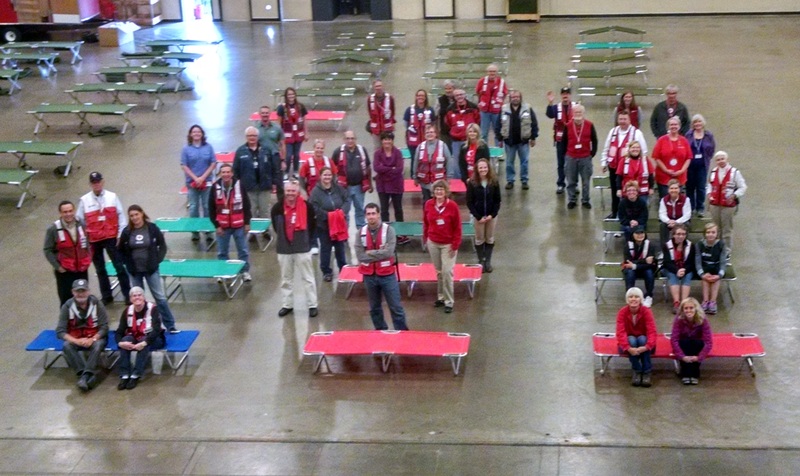 These volunteers help fulfill the Red Cross mission to reduce human suffering during emergencies. Red Cross dispatchers coordinate response teams that provide basic comfort and care to families after home fires and other disasters. These dispatchers serve their communities with care. 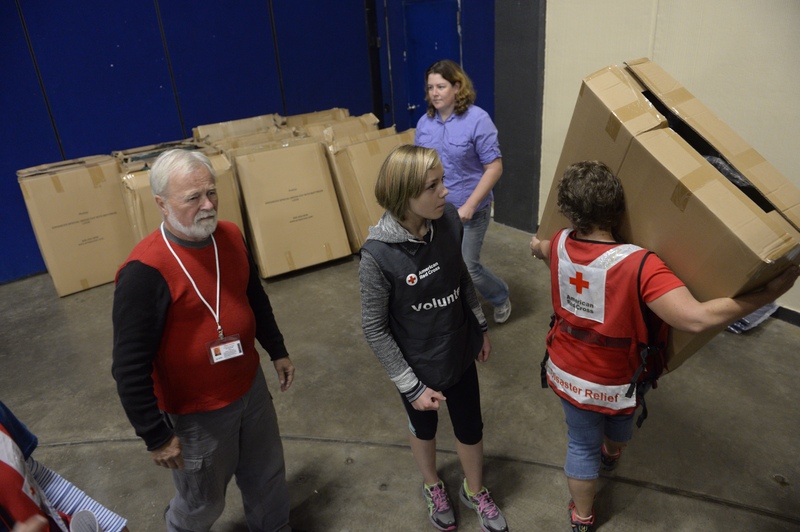 This volunteer role is one of the most worthwhile ways to get active in the Red Cross. Below are brief portraits of five volunteers who serve as disaster response dispatchers for the Minnesota Red Cross region. 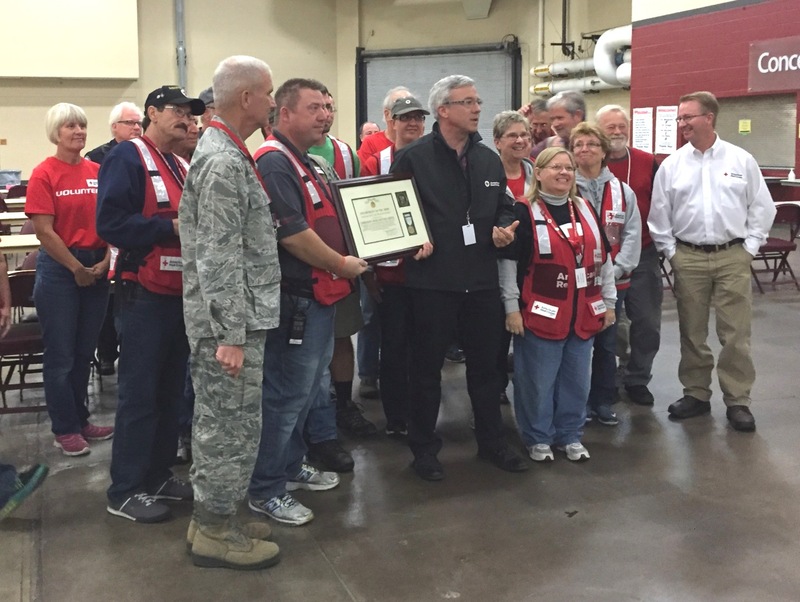 Based in central Minnesota, Mike and Deb Hofmann proudly serve together as Red Cross volunteer dispatchers. The couple met in high school and they currently living in Cold Spring. Mike has served the American Red Cross for 40 years through multiple volunteer positions and Deb has been with the organization as a dispatcher for 10 months. Some of the most rewarding parts of the job for the couple is knowing you can help people during their time of need and offer services. Deb says, “When they’re looking for a way to go, we give them a direction.” Their advice? If you want to get involved, connect with your local Red Cross chapter. 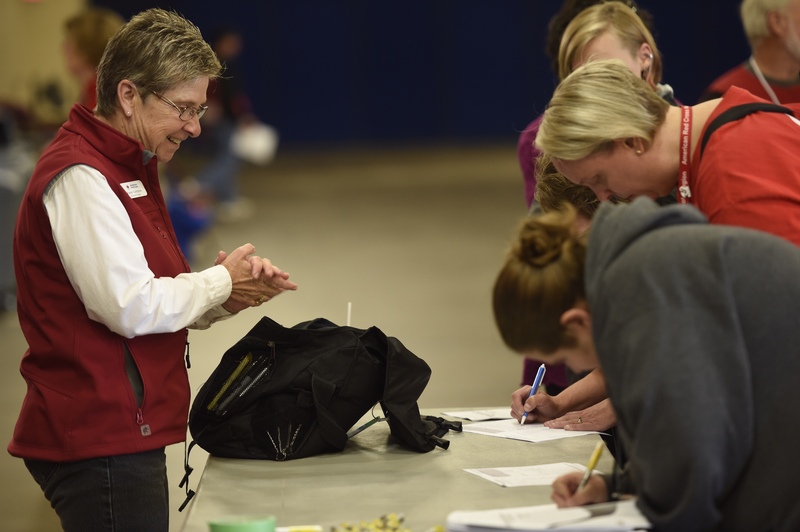 After retiring as a health and physical education teacher, Diane Dunder decided to take on the volunteer role as a Red Cross disaster relief dispatcher. Dunder says she was graced with “the best instructors who knew what they were doing and were very well informed about the job.” Some of the role’s challenges in her area, she says, are not having enough field responders as well as other dispatchers. “We all have other things going on in our lives and yet more help would be appreciated.” One of Dunder’s greatest rewards while serving as a dispatcher was helping an elderly woman after a house fire. The victim had health issues and Dunder spent several days following up and working with healthcare and mental healthcare professionals to make sure that the woman was safe. “Being a dispatcher is a great way to volunteer and keeps you educated,” says Dunder. Jan Reyers has served as a volunteer with the Red Cross for more than 35 years. Most currently, he’s disaster response dispatcher based in the Minneapolis-St. Paul metro area. Originally from White Bear Lake, Jan is proud to serve with the Red Cross alongside his wife Bonnie, who is also a dispatcher. “It’s always nice to have your wife as a dispatcher to help coach you along.” Being a dispatcher has taught Jan how to prioritize what he’s doing and to get it done correctly. Jan says the skills you need in order to become a dispatcher are communication, organization of information and people, and demonstration of empathy. Having served as a disaster responder in the field helps. “Get involved, sign up and be available to serve,” is Reyers’ advice to all anyone who wants to participate with Red Cross disaster relief teams. The need for Red Cross volunteer dispatchers is great. 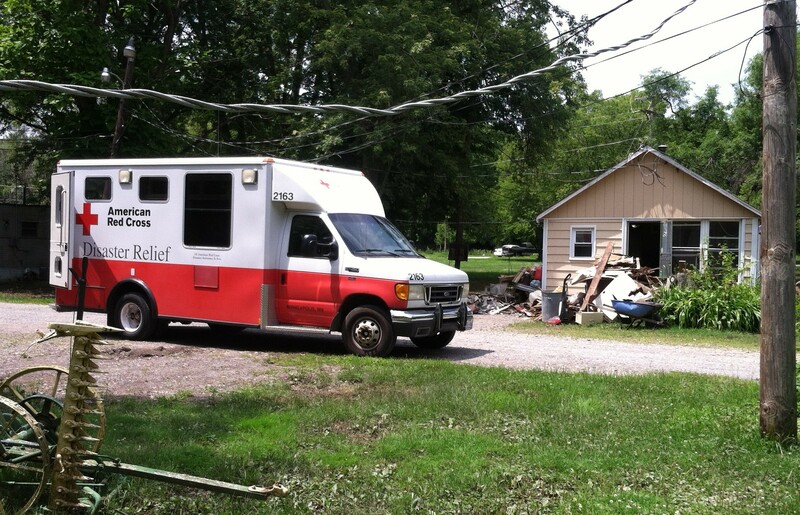 Last year the Red Cross supported more than 2,500 people affected by local disasters, which were mostly home fires. It’s a great way to serve and to meet new people. The current Red Cross dispatchers need to you step up and to get involved! More importantly, your neighbors, friends, family and thousands of others across this region need you. You never know when hard times will strike and you could lend a hand to someone who needs it the most. You could be the person who gives someone hope during a time of despair and a way to look toward a brighter tomorrow. To learn more, click here. 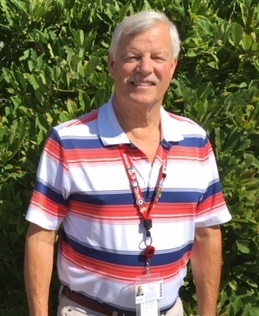 It’s been ten years since Katrina, and Dan Hoffman is still a dedicated Red Cross volunteer. Photo provided courtesy of Dan. “I became a Red Crosser for life after Katrina.” Ten years ago, Dan Hoffman, from New Brighton, Minnesota, was one of 245,000 Red Cross disaster workers who responded to Hurricane Katrina, which hit the Gulf Coast on August 29, 2005. 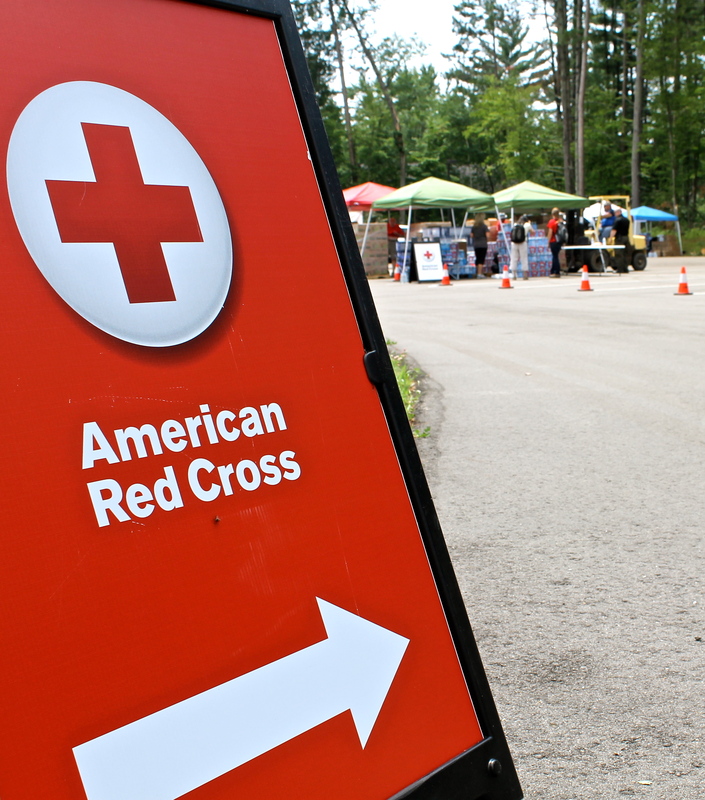 Dan recently sat down with Red Cross intern Vivi Engen to look back on his experience. Tell me about how you got involved with Katrina. Katrina was my first national deployment. At the time, I was an employee for the Red Cross at the St. Paul Chapter and a trained disaster volunteer. I got a phone call on the day the storm hit asking if I wanted to deploy, and I accepted. I was on a plane later that afternoon headed down to Houston. From Houston, I was assigned to work at a 6,000 person American Red Cross shelter at the Convention Center in Baton Rouge, Louisiana. 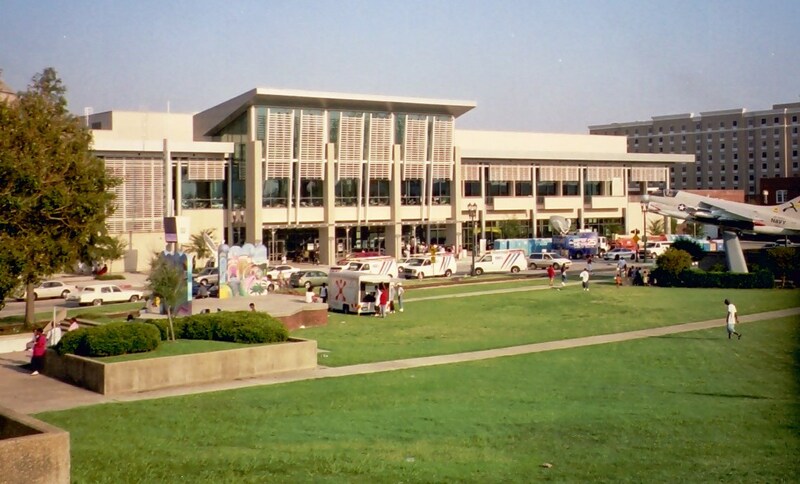 The Convention Center in Baton, Rouge, LA where Dan Hoffman worked during is deployment. Photo provided courtesy of Dan. What was it like to be at the shelter? The first few days I would describe as organized chaos. Buses and helicopters unloaded a steady flow of scared, mud-covered people just pulled from disaster. We knew what we needed to do–what the Red Cross always does–everything from setting up portable showers outside the convention center, to providing clothes and hygiene kits, and registering people and contacting other shelter locations to find lost loved ones. We did this for 12 hours a day, and just like the refugees, slept on cots. We saw, and lived it all. I knew that I was part of something big and wouldn’t have wanted to be anywhere else. Tell me about what you did there. I think a better question is what didn’t I do. I worked the floor so I did whatever needed to be done. I did everything from giving teddy bears to kids, diapers to moms, to taking down names of people sleeping on cardboard boxes because we ran out of cots early on and pushing people around in wheelchairs who couldn’t walk. But more than anything I would just listen. These people were hurting and needed to tell their story. What were some of the stories that had an impact on you? Red Cross relief workers busy at the shelter in Baton Rouge, Louisiana. Photo provided courtesy of Dan Hoffman. Miss Evelyn was one of our shelter residents. Her home had been destroyed by the storm, and when the rescue crew came to save her, they told her she had to leave her dog, Pepper, behind. Pepper was Miss Evelyn’s only family, and she was heartbroken without him. There was a pet shelter set up at Louisiana State University, and a couple of days after talking to Miss Evelyn, I stopped over there while on a supply run to see if I could find her dog. I found a Red Cross worker and asked her if she had seen Pepper and she said she would be in touch. A few days later, I received a few photos of different dogs at the shelter. I showed them to Miss Evelyn and, wouldn’t you know, there was Pepper smiling back at her in one of the photos. Another woman, Hattie Mae, came to the Red Cross shelter unable to walk, and unable to fit into a wheel chair. A day later I stopped by the local hospital and “commandeered” an over-sized wheelchair to lend to Hattie Mae because she needed something to get around in. I will never forget the look on her face, or the hug that she gave me, when I came back with that chair. 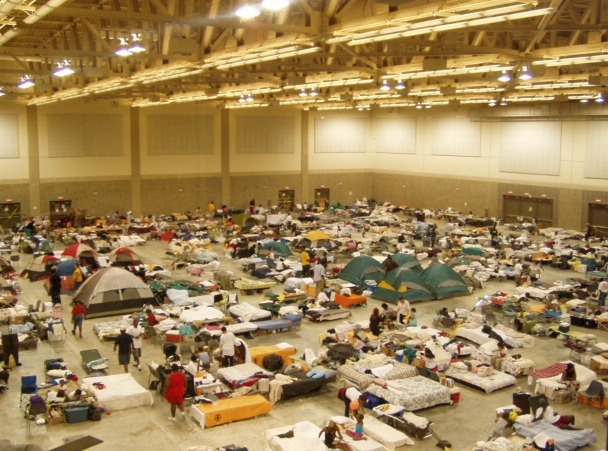 Cots were set up all through the convention center in Baton Rouge, Louisiana, for Hurricane Katrina refugees who lost their homes. Photo provided courtesy of Dan Hoffman. Miss Amelia, another refugee, who was a kind of matriarch over a large family community, introduced me to her family. “This is Mr. Dan, he’s Red Cross, so listen to him.” It sure gave me instant credibility. Then she turned to me and said “You came all the way form Minnesota to help us, you must be an angel.” I am no angel, but I do share the gratitude that the refugees had for my work, for the experience that they gave me. The people at the shelter who had lost everything were so gratified, so appreciative for the smallest things that it changed the way I see life today. And that’s something I will never be able to repay them for. How did this experience transform your commitment to the Red Cross? 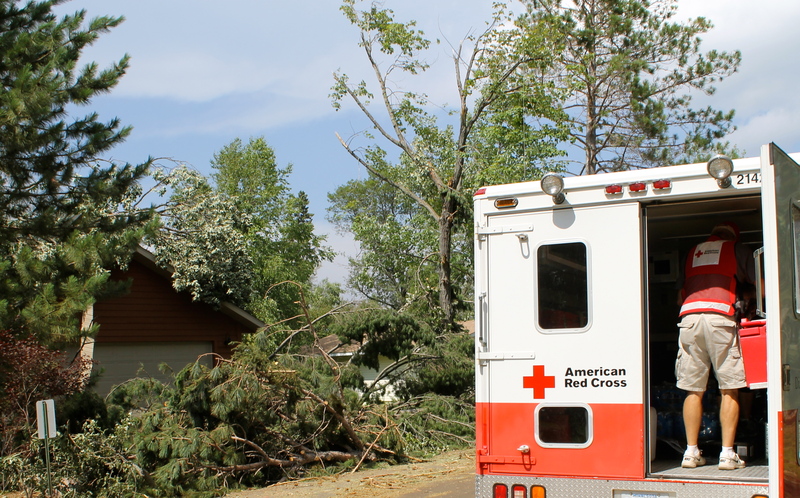 After Katrina, I realized that the work that the Red Cross does is my calling. Once I came home, I shared all of the incredible stories I had been told, what the Red Cross did and how the Red Cross helped all these people. Just like the stories of the shelter refugees needed to be shared, so did the Red Cross’. 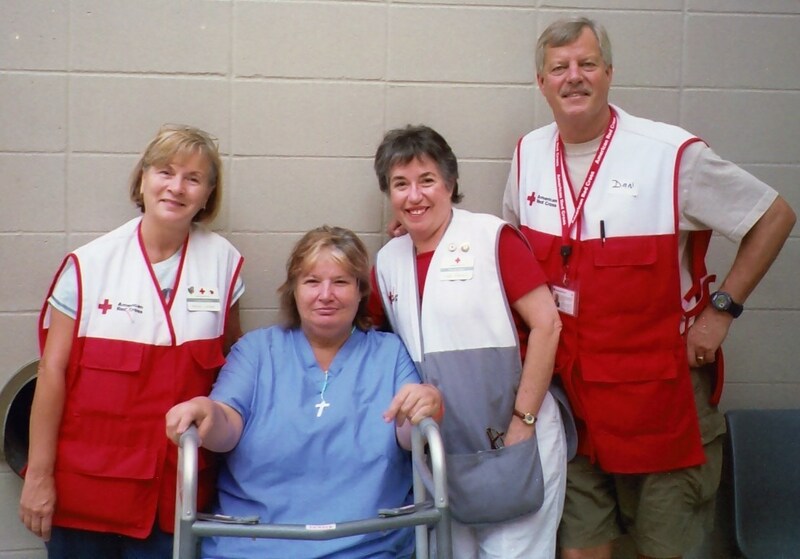 Dan Hoffman (far right) with other Red Cross disaster relief workers and a Hurricane Katrina refugee in Baton Rouge, Louisiana. Photo provided courtesy of Dan. I’d like to finish up with a woman named Misty. While working at a shelter as a volunteer, you half adopt people while you are there, meaning there are certain individuals that you go in to check on or eat with them on a regular basis. Misty was one of those people for me. Misty is a poet, and on the day of the storm she wrote a poem that was angry. Angry at Katrina and all of the destruction it had caused and how it impacted her–she lost her dog and everything she owned. A few weeks after I got home, I received a letter in the mail. It was another poem from Misty titled “Thank You”. The last line of the poem read “memories of you will never leave my heart.” Now I ask you, how could an experience like that not change your life? To learn more about how you can volunteer with the Red Cross, chick here. What does a Red Cross nurse do during disaster? 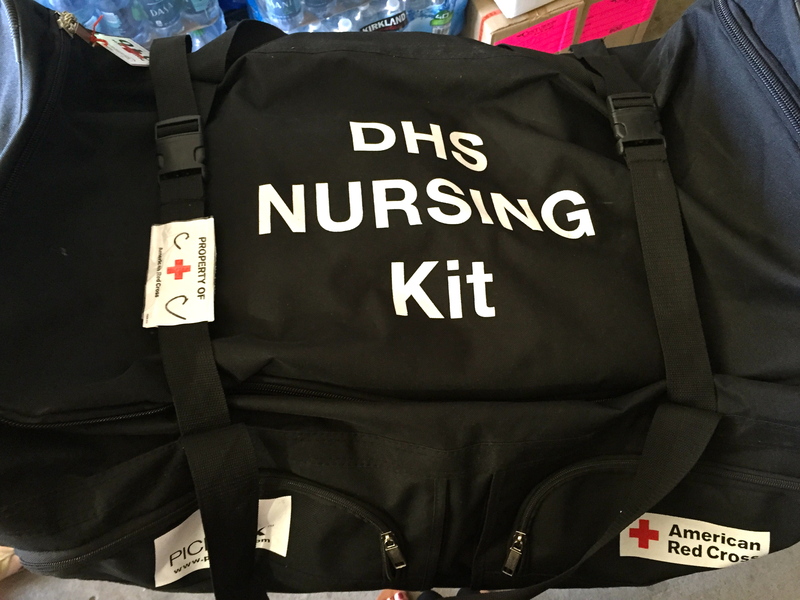 The Disaster Health Services Nursing kit is condensed into one duffle bag and can serve up to 50 people at a shelter. 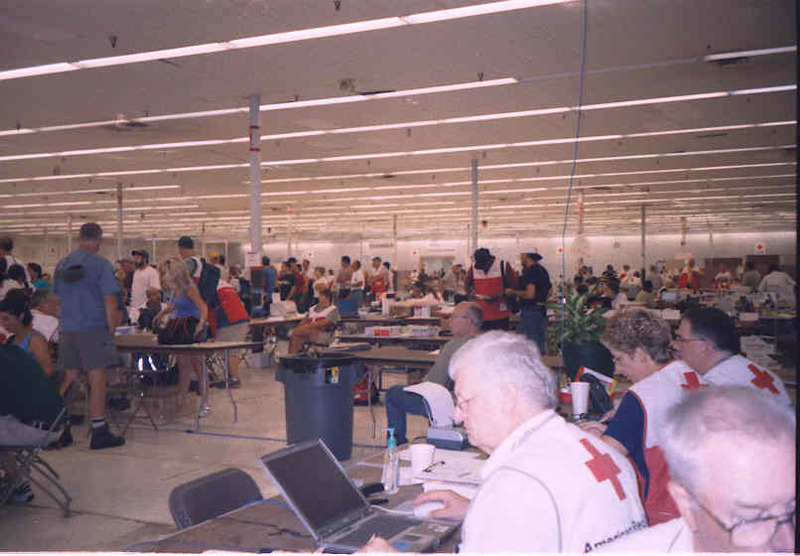 During large-scale disasters, Red Cross nurses serve as the initial medical response at a shelter. They assess basic medical needs of clients and address quick and easy fixes, such as a cut or sprain. Anything more severe is treated at a hospital. 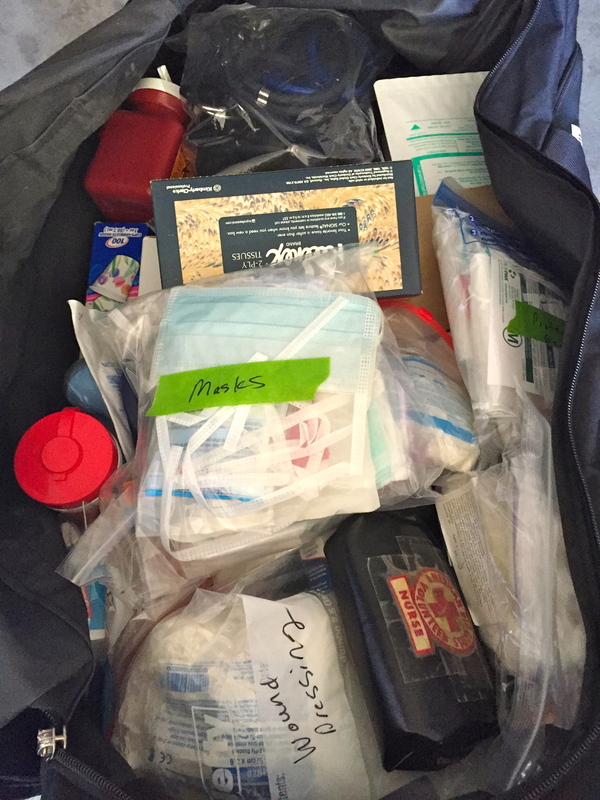 To speed nursing response during disaster, the Disaster Health Services team in Minnesota recently introduced a nursing kit that will be used at shelters during responses across the state. The kit, which is condensed inside a single duffle bag, provides a quick-response supply for up to 50 individuals. Supplies include over-the-counter medication, wound dressings, CPR masks, bandages, protective gear and more. Kami Buccellato goes through the supplies inside the Nursing Kit. 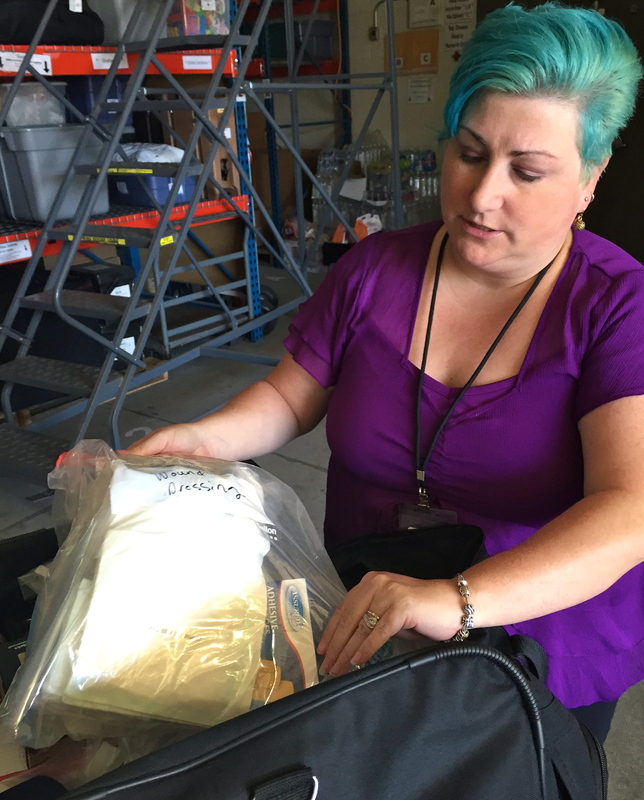 Earlier this year, the kit was used for the first time at a shelter after an apartment fire. Disaster Health Services received positive feedback on the condensed bag and was happy to report that the kit contained its critical response supplies. A look at the contents inside the Nursing Kit. The American Red Cross is always looking for new nurses who are ready to be put on the disaster scene. “Any nurse looking to gain experience, meet new people, and share knowledge is welcome in Disaster Health Services,” says Buccellato. Are you a nurse? Have you ever thought about volunteering? If so, the Red Cross wants you. To apply, click here. 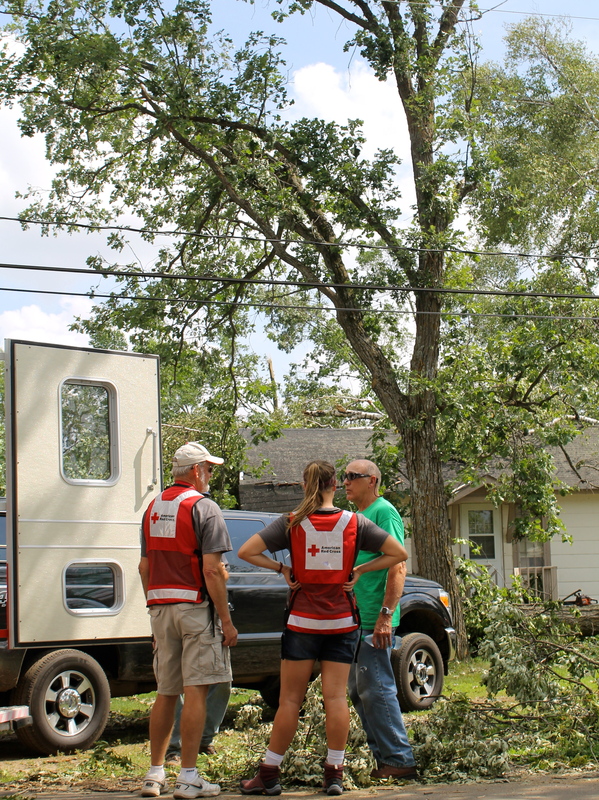 Red Cross disaster relief workers have been on-the-ground in the Brainerd Lakes, Minnesota, area since a severe windstorm struck on July 12, 2015. 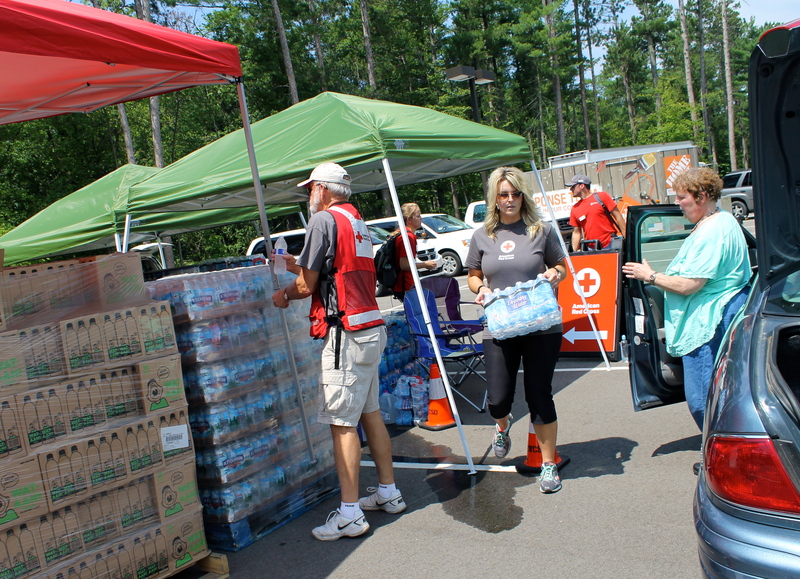 Red Cross support currently includes providing water, ice and relief supplies to families and clean-up crews, and assessing damage of neighborhoods. The Red Cross continues to coordinate its relief efforts with local and regional partners that are responding to the disaster. 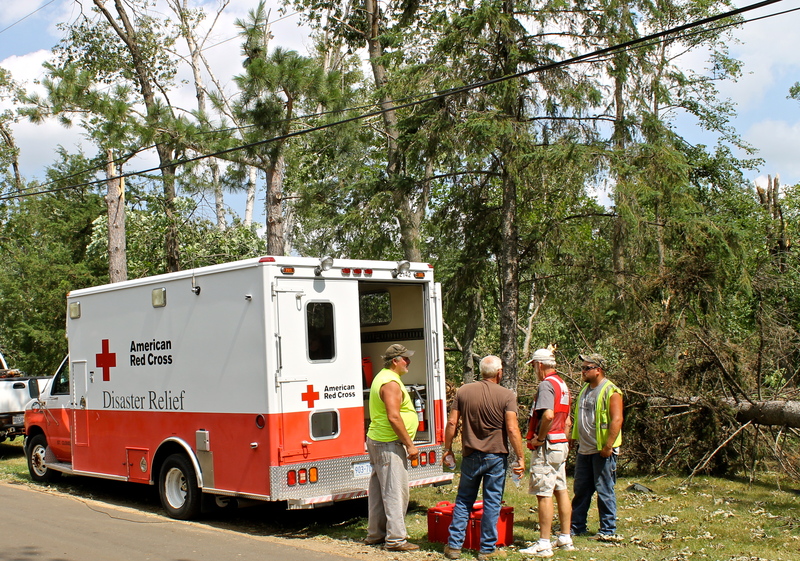 The American Red Cross, along with the Salvation Army and the local sheriff department, distributed water, ice, and other relief supplies from a shared field station at Timberwood Church, south of Nisswa, Minn., July 15, 2015. Photo credit: Vivian Engen/American Red Cross. 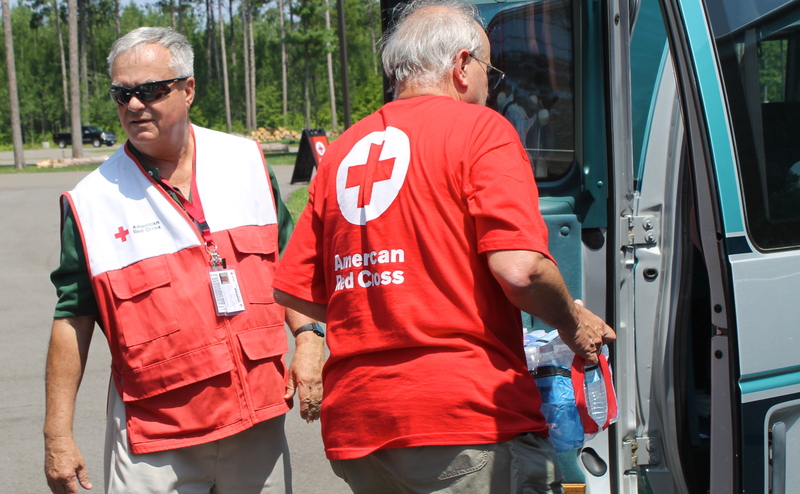 Red Cross volunteers Gary Larson (l) and Ken Vertin (r) spent the day in Nisswa, Minn., loading cases of water into local residents’ vehicles on, July 15, 2015. Photo credit: Vivian Engen/American Red Cross. Red Cross volunteer Connie Barsness carried bottled water to the car of a local resident who has been without running water since the storm on Sunday. The power is expected to return to the area in the next few days, but until then, local residents will continue to rely on alternative water sources, July 15, 2015. Photo credit: Vivian Engen/American Red Cross. 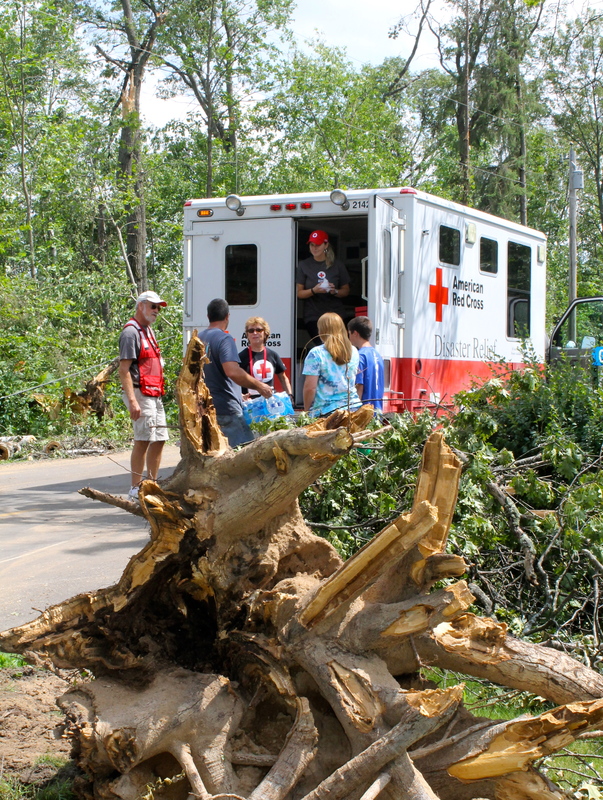 Two Red Cross Emergency Response Vehicles (ERVs) are canvassing the hardest hit areas and bringing aid to those without power and cut-off from other resources by downed lines and trees, Gull Lake Dam Road, July 15, 2015. Photo credit: Vivian Engen/American Red Cross. 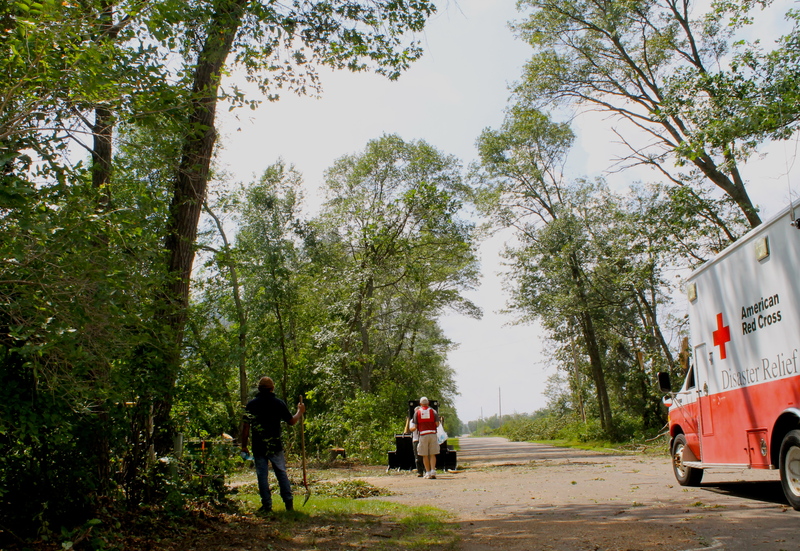 The storm that ravaged the Brainerd Lakes area on Sunday, July 12, 2015, is being compared to a stage one hurricane by local officials. Debris littered the street, at times making it difficult for the Red Cross Emergency Response Vehicle (ERV) to get through to affected areas, Gull Lake area, July 15, 2015. Photo credit: Vivian Engen/American Red Cross. 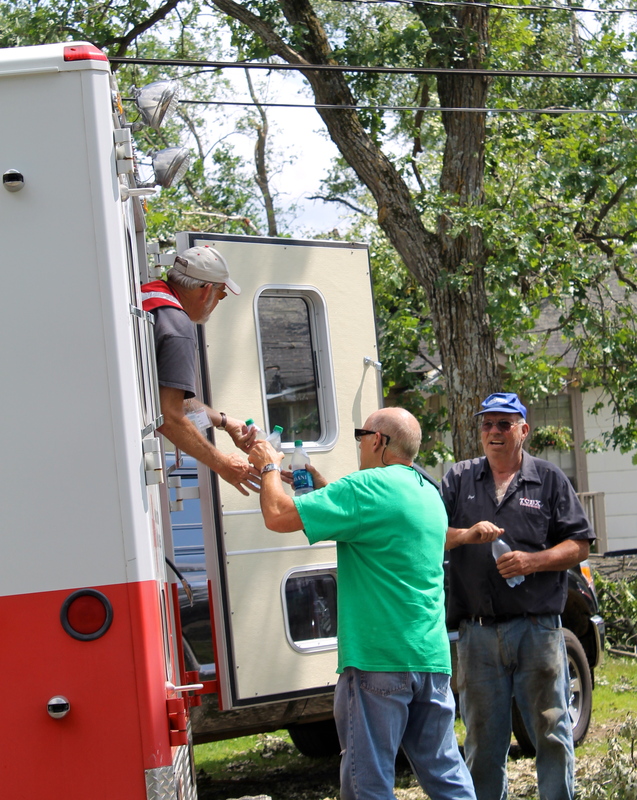 Red Cross volunteer Rick Campion (l) distributed cold water to local residents Ronald Hines (c) and Lloyd Baakkonen (r) from a Red Cross Emergency Response Vehicle (ERV). “We heard your horn and came running,” said Baakkonen, who, despite having a tree through his roof, had a huge smile on his face. “There’s nothing better than cold water.” July 15, 2015. Photo credit: Lanet Hane/American Red Cross. Red Cross volunteers Rick Campion (l) and Vivian Engen (c) spoke with Ronald Hines (r), who was cleaning up following the windstorm. “I had a generator in the basement that I’d never used before, but figured it would come in handy if something bad were to happen,” Hines said. “I was right.” July 15, 2015. Photo credit: Lanet Hane/American Red Cross. Many homes in the Brainerd Lakes area were hit hard by the storm on July 12, 2015. Amidst uprooted trees and debris, one family told Red Cross volunteers that a tree went through their roof. Their entire home will be torn down because the damage was so extensive. July 15, 2015. Photo credit: Vivian Engen/American Red Cross. 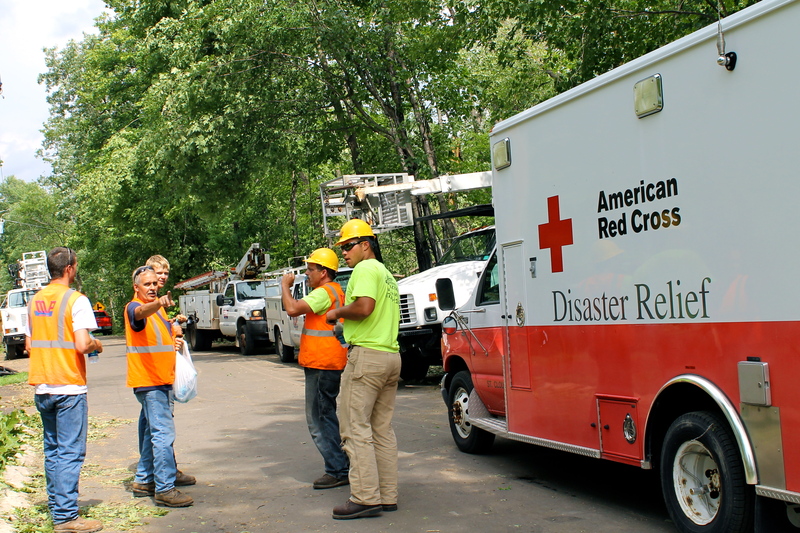 To date, the Red Cross has distributed thousands of bottles of water and hundreds of pounds of ice to Brainerd Lakes area residents and work crews cleaning up in hot and humid conditions following the windstorm. July 15, 2015. Photo credit: Vivian Engen/American Red Cross. 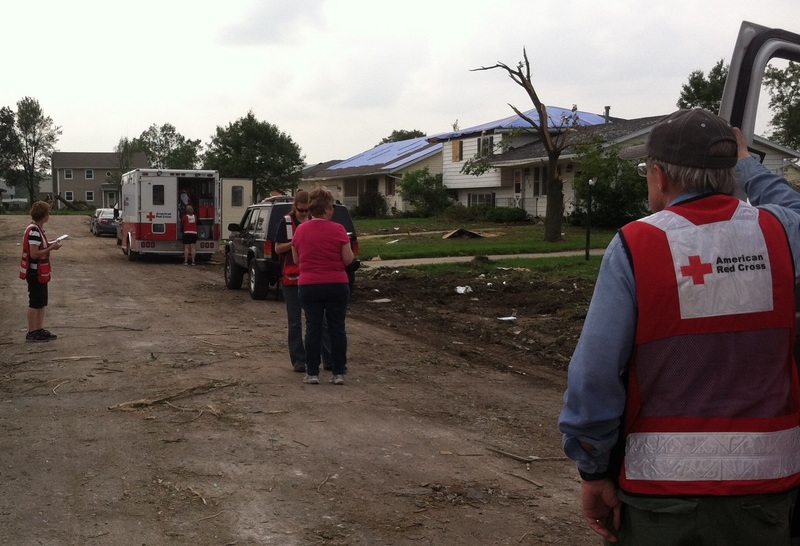 Red Cross volunteer Rick Campion walked through an storm affected neighborhood in the Brainerd Lakes area on July 15, 2015. Photo credit: Vivian Engen/American Red Cross. What You Can Do: Download today the Red Cross Emergency App for real time access to weather alerts, preparedness information, safety tips and shelter locations. The Emergency App provides expert advice on what to do during and after, tornadoes, wildfires and other disasters. The app provides lifesaving information on emergency first aid for various situations such as what to do for heart attacks, heat-related emergencies and includes water safety tips. Pre-loaded content ensures that guidance from Red Cross experts is available anytime, anywhere – even without mobile connectivity. After I retired, I wanted to find a worthwhile way to spend my new-found free time. I remembered hearing about volunteers who packed up when various disasters occurred and served with the American Red Cross. And I decided that was what I wanted to do. As soon as I began my training, I learned that the first Red Cross relief workers to to arrive on-scene at a local disaster are Disaster Action Team (DAT) members. These response teams are trained to be efficient and effective in their efforts helping people, and I quickly joined the squad. After becoming a disaster relief volunteer I started to ask, what happens when the disaster gets bigger? There are many different jobs when large-scale disasters, such as a tornado or hurricane, hit a community. I learned that my experience driving trucks and managing computer networks could be useful. I expressed my interest in and willingness to be on-call in this response activity if needed. On June 29th I got a call that the Red Cross needed the Minneapolis Emergency Response Vehicle (ERV) to help out in Illinois, and for the first time I was able to say yes. I partnered up with another volunteer named Bill Craig, a delightful gentleman from St. Cloud, MN, who had disaster experience after being deployed to Hurricane Sandy. We took off from Minneapolis on June 30th and arrived at the Red Cross chapter in Romeoville, IL, on morning of July 1st ready to receive our assignments. We were dispatched to the Bourbonnais and Kankakee, IL, office where severe flooding and tornadoes damaged the surrounding area. We loaded our ERV with cleaning supplies, drinks, snacks and shovels, and headed for Cole City, IL. Cole City is a small, rural town that a recent tornado had ripped through, leveling several neighborhoods and wreaking havoc throughout the town. After several hours distributing relief supplies to people in Cole City, we returned to Kankakee where we helped open a Multi-Agency Resource Center (MARC). A MARC is where different service agencies congregate to provide a one-stop service center for folks affected by local disaster. I quickly learned that as a volunteer, I was there to help with whatever needed to be done. One minute I was in the gym setting up tables and chairs, and the next I was being asked to set up a small computer network to serve the folks that would be coming in the next day. Our second day started at 6 a.m. 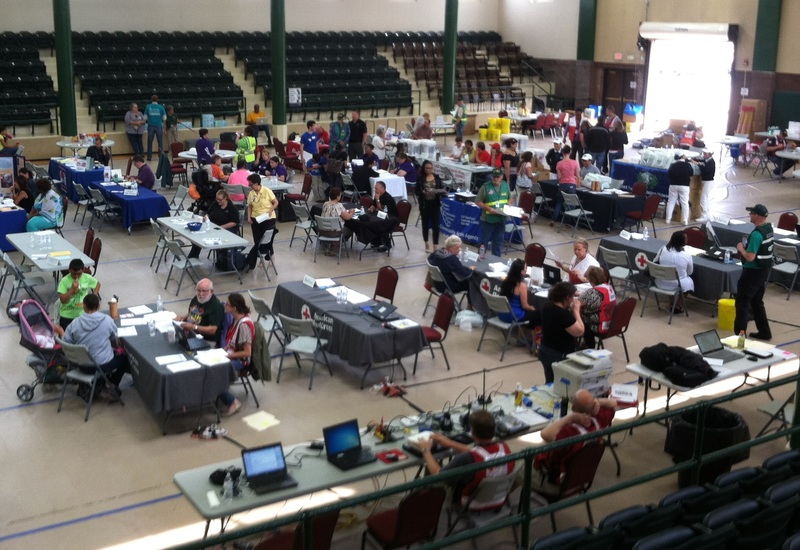 The MARC ran ten computers and two laser printers to service the needs of affected residents. Once the network was up and operating, the local volunteers had everything under control and I moved back to my ERV role. We spent the morning loading relief supplies into people’s cars and handing out drinks and food. There was a flood of people that came to the MARC after lunch, so my job transitioned to walking families through the in-take process. By the time the doors closed at 6 p.m., we had processed 160 families. On day three, we met at the Bourbonnais office at 10 a.m. and loaded flood clean-up supplies and headed for a small, rural town called Momence, IL. We paired up with a case worker from Pennsylvania and drove around the town to see where help and supplies were needed. We soon ran out of cleaning supplies and had to call for back up because so much damage had been done. We out-processed at the Romeoville office about 7 p.m. and started the drive back to Minneapolis. We finished our journey back in Minneapolis on the 4th of July and got in about noon. The biggest lesson I took from my four days on an ERV is that the world is not as bad as we make it out to be. Today, the news is full of terrible accidents, criminals and disasters. But what I found was that there is some beauty left in the world. The vast majority of Americans are kind and compassionate people. When our neighbors get hit hard most of us don’t just drive by, we stop and help. Almost everyone that I put my hand out to was unbelievably grateful and had the “I may be down but I’m not out” look in their eyes. Lee Greenwood is correct: I’m proud to be an American. To learn more about becoming a Red Cross volunteer, click here. 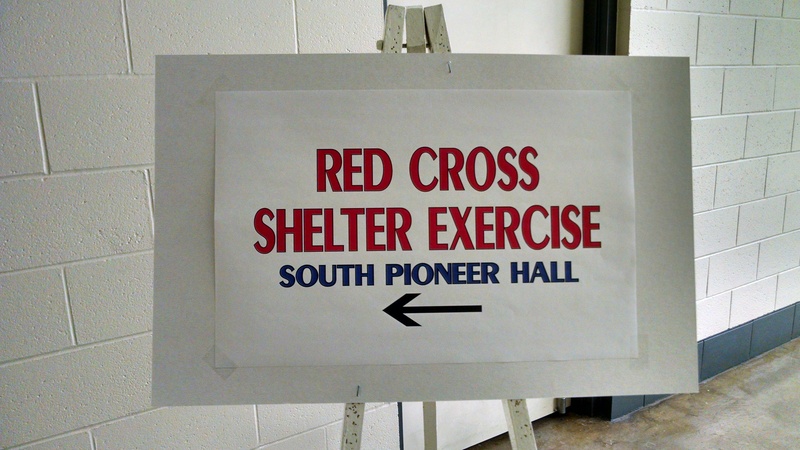 To browse more ways to help fulfill the Red Cross mission, click here. 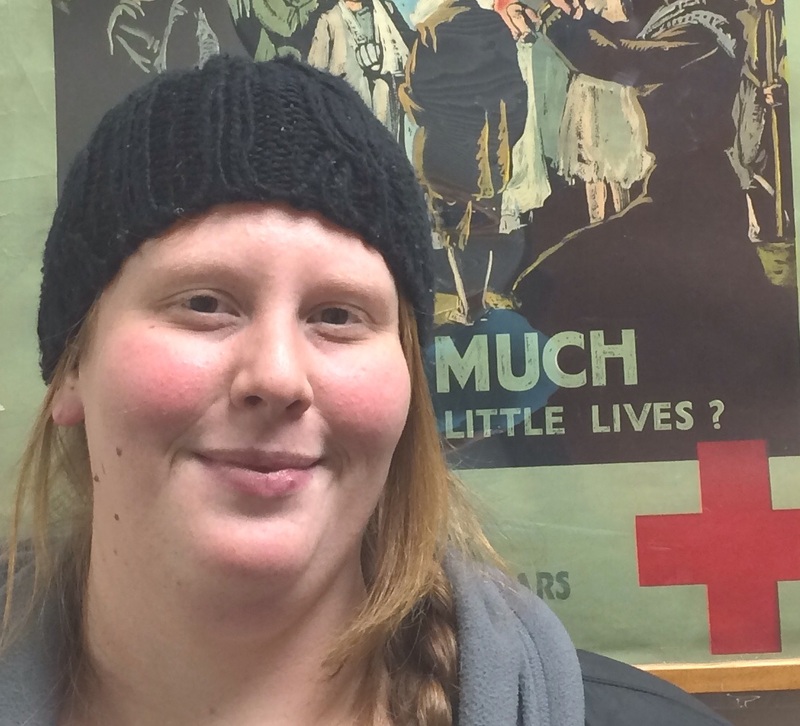 Meet Melinda Wittmer, a Disaster Services volunteer for the American Red Cross serving Northern Minnesota. Melinda has been a Disaster Services volunteer since 2011, and is part of the Disaster Action Team (DAT). She also has recently taken on a new role with Volunteer Services – she’ll be interviewing prospective volunteers to introduce them to the volunteer opportunities at the Red Cross and help them find a good fit. Fast forward to Melinda’s adult life when she was working at a group home and became very close to an individual who turned into one of her favorite clients. His health declined and he was put on life support, and then eventually taken off. At that moment Melinda decided she wanted to do something good and help people. She went to the Red Cross office in Duluth, Minnesota, to ask a few questions, and was immediately “roped in.” Within minutes she was filling out an application, and the rest is history! A few months ago Melinda went through the difficult experience of responding to an incident that involved a fatality. Additionally, it turned out that she was familiar with the person who died. Despite the difficulty involved in this response, Melinda took away the feeling that she was there for the family to help them with the “begin-again phase” of their lives. The Red Cross has made Melinda more confident, and through her interactions and meeting other volunteers she has become interested in pursuing a career in Emergency Management. Melinda certainly embodies the mission and fundamental principles of both the American Red Cross and Red Cross and Red Crescent Movement around the globe. She’s always ready, willing and able to assist and a great comfort to those who have suffered a loss because of home fires and other disasters. Story and photo by Nancy Rogers, Volunteer Services Coordinator for the American Red Cross serving Northern Minnesota.